Fossil Insect Borings in Dinosaur Bones. Every day dozens of articles are published that contain evidence that runs contrary to the young-earth creationist’ (YEC) view of earth’s history. The young-earth view proposes that much or most of the thousands of feet of fossil bearing rocks—and the fossils themselves—that make up the world’s land masses were deposited during a single catastrophic world-wide flood approximately 4350 years ago. In reference to that Flood, Ken Ham and other YECs are fond of asking: If there really was a Flood, what would the evidence be? Billions of dead things, buried in rock layers, laid down by water, all over the earth. After which Ken Ham continues: Well, that is exactly what we see – billions of dead things, buried in rock layers, laid down by water, all over the earth! Ken Ham is right about one thing. There are billions of dead things buried in sediments laid down in water although this is a vast underestimate of the number of fossils. He is wrong to assume that those same fossils must have been deposited by a global flood event, or even necessarily by water. Yesterday, an article was published that highlights a problem with flood geology that we have addressed before: the preservation of complex ecosystems in the fossil record. The article reports evidence of multiple forms of insect borings in hadrosaur dinosaur bones. These are trace fossils which are evidence left behind of an animal’s activity. Dinosaur footprints are another example of a trace fossil. In this case the paleontologists identified considerable evidence that insects had been boring into these hadrosaur bones to both find food resources and likely locations to lay eggs. What does evidence of scavenger dermestid (skin, carpet, hide) beetles and possible termites chomping away and possibly making a home in hadrosaur bones have to do with the YEC claims of a recent global flood? It raises the question, if hadrosaurs were all killed and buried under massive sediment layers in a global flood how did their bones come to be eaten by beetles? YECs may respond as they have to a similar question about dinosaur nests with eggs laid in the middle of a cataclysmic flood. They claim (see: Juvenile Dinosaurs Found Huddling in a Nest) that pregnant dinosaurs which had been treading water and running up mountains to escape the global calamity wandered, during some lull in the chaotic global catastrophe, onto layers or newly deposited sediments. This time was so stressful for these dinosaurs that they sought out any place they could lay their eggs. Apparently, there were tens or even hundreds of thousands of these stressed pregnant dinosaurs that escaped the initial onslaught of the global deluge and were running around desperately making nests and laying eggs during this time. 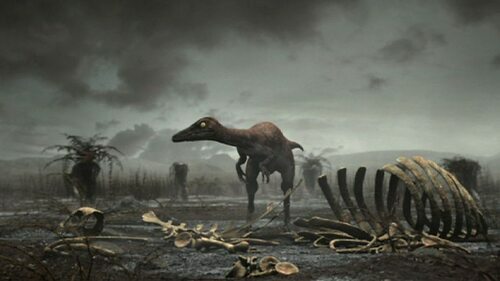 Soon after laying these eggs, their nest and eggs, were covered by the continuing global events that eventually killed all the dinosaurs, except those preserved on the ark, and covered over the nests with fresh sediments allowing them to be preserved and eventually discovered by us today. As implausible as this scenario painted by YECs might sound, their hypothesis is rendered utterly implausible when the physical evidence from dinosaur nests and in this case, evidence of insect damage are carefully considered. In this case we find a set of hadrosaur bones that must have laid out in the open for some time allowing the bones to be defleshed. Those bones could not have been buried and must have been fairly dry to allow a colony of insects to take up residence. There is evidence that the insects lived here through several stages of development strongly pointing to the bones being uncovered for weeks if not months prior to finally being covered by sediment and preserved to this day. Even if a hadrosaur had somehow survived the early global flood onslaught only to die on a small strip of land that was temporarily available during the Flood year, how did these beetles find these bones? Surely these beetles were not flying around above the Flood waters for months and then able to find this hadrosaur on a beach. The fact that there could have been several species of insects that made a home in these bones suggests the presence of a complex ecology is present that one would not expect to find in the randomness of a chaotic world-wide catastrophe. There are far more reasonable explanations for the preservation of insect borings in dinosaur bones that don’t include a global flood. YECs often promote their view as being the best explanation for the geological features of the Earth and the fossil record. However, over and over again, a close inspection of the evidence shows that the YEC hypothesis is nothing more than an artificial construct with no explanatory power. It exists solely to maintain a specific, apparently infallible, interpretation by Ken Ham and others of the Bible.